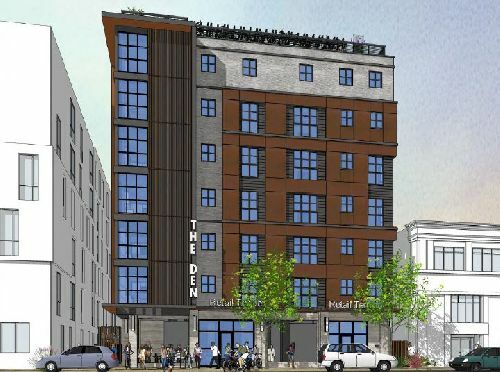 The Austin Group has obtained $26.25 mil in development money for The Den, a 160-bed student housing development located in the heart of Downtown Berkeley, at Telegraph Ave and Channing Way. The site, requiring demolition of the existing retail/office space, is located just two blocks from campus. The Den will consist of seven levels containing 40 units and 160 beds in a mix of layouts, as well as 2.5k sf of retail/restaurant space. The eight-story project will feature a rooftop balcony and garden to allow for student gatherings and take advantage of the beautiful views. The Den will receive a GreenPoint environmental certification equivalent to LEED Gold. Located next door to the University’s Maximino Martinez Commons sophomore dorm, the completed project will create much-needed student housing as well as complement the block’s collegiate pedestrian vibe. The financing, arranged by Highland Realty Capital, originally consisted of a $2.25 mil land acquisition and pre-development loan in April 2017, which was sized at 70% loan-to-purchase-price. Once entitled, which caused the land value to increase significantly, Highland secured a $24 mil construction loan, representing 87% of the actual project costs. The construction loan was sized to $600,000 per unit at a spread in the mid 300’s over LIBOR. The lender is a foreign bank not subject to Dodd-Frank’s HVCRE requirements.